If you've been following Iranian cinema in recent years – and you really should have – then the name Jafar Panahi should be familiar to you, probably for his 2000 film The Circle, a compelling, cleverly structured but sobering examination of the plight of women in modern day Iran. Those who know that film may well be surprised by his latest venture, or at least the prospect of it, a film based around football and comedic in nature. Actually, the very idea of a comedy film from Iran may well raise a few eyebrows, given Iranian cinema's fascination with small, serious-minded stories, often carrying a social, political or humanitarian message. But Panahi is not first through the gate here – just two years ago Kamal Tabrizi ran into a little trouble on home turf when he poked fun at his country's clerical figures and customs in The Lizard [Marmoulak]. And before you go expecting a Middle Eastern Carry on Football, you should know that Offside has a lot more in common with The Circle than you might initially expect. The film opens in typical Iranian style, on a single, uninterrupted shot of a male passenger in the back seat of a cab conversing with a driver who is never shown. The man is chasing after his daughter, who has gone off on her own with the intention of attending a match that could see Iran qualify for the World Cup for the first time in eight years. His mission is to stop her and take her back home, because in this rigidly patriarchal society, women are forbidden entry to professional football matches. The man persuades the taxi driver to pull up in front of a bus carrying supporters to the match, but his daughter is not on board. When the taxi scurries off without him, he hitches a ride on the bus, hoping to find his daughter at the stadium. As another busload of supporters passes, he wonders aloud if she might be on that one. As a matter of fact she is, sitting quietly by herself, her face painted with the national flag, hoping to pass off as a boy and not doing too well at it. One of her fellow passengers points out that she looks a bit too girlie but wishes her luck anyway, and a ticket tout at the grounds ups his price outrageously to compensate for the risk he claims he is taking by selling to her. She's barely through the gates when she is nabbed and handed over to the young military conscripts who have been charged with stopping the likes of her from getting in to see the match. Her protestations and pleas ignored, she is led up to a fenced-off area containing three other female hopefuls and told she is to be held there until the military supervisor arrives. Iranian cinema is rarely big on plot, preferring to concentrate on character and situation, something it often excels at. Offside is no exception, with the bulk of the film focussed on the argumentative relationship that develops between the girls and the young soldiers charged with guarding them. This is smartly and sometimes delightfully handled, the soldiers' initial position of authority increasingly undermined by the arrival of a fiercely defiant and confrontational girl (a spirited performance by Shayesteh Irani) who challenges her captors on just about every point they make, and another who has cheerfully dressed up in a soldier's uniform and gained entry to the match, but whose over-confidence got her nicked when she parked herself in the seat reserved for the Chief of Police. The humour arises largely from the absurdity of the situation the girls find themselves in. When the conversation inevitably moves to the reasons for excluding women from the ground, for example, the soldiers claim that it is because they should not be subjected to the swearing that takes place when men watch the game ("We promise not to listen!" one girl pleads), language that both parties use here with carefree abandon. In the most bizarrely funny scene, one of the girls is escorted to a male toilet ("There are no toilets for women here!") 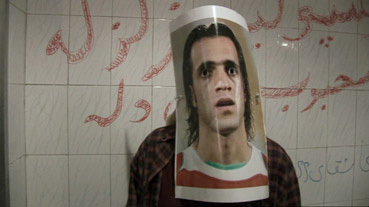 wearing a life-sized poster of a football player's face as a mask in order to disguise her gender, then told to cover her eyes so she will not be corrupted by the graffiti on the toilet walls. If the film's primary concern is the unequal status of women in their own society, then it is also very much about the unifying nature of the beautiful game. 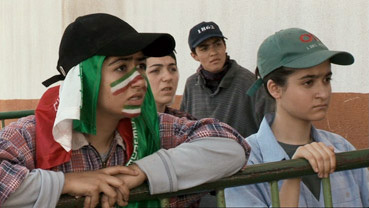 Initially a further example of the male-female divide, it later, as the girls and the soldiers listen anxiously to the final minutes of the match on the radio in their van, becomes a social leveller, pulling down the barriers between uncomfortable oppressor and unwilling oppressed that both religion and state have helped put in place. And you really don't have to be a football fan to appreciate this – the sheer passion expressed by both the characters and the film itself for the game is remarkably infectious, leading to a final ten minutes consisting largely of the celebratory joy of victory and the thrilling sense of community and equality that results. Rarely, if ever, has an Iranian film with serious political concerns ended on a note of such euphoric optimism. Naturalistically performed and documentary-like in approach, there is a compelling sense that we are watching events very much as they happen, but the narrative is so well structured and individual scenes so effectively executed that you just know this was planned to perfection. * Even the title nicely reflects both of the film's key concerns, a football term that makes allusions to the women's position in their own society – as rigidly enforced as any other, the offside rule famously remains the hardest for those not familiar with the game to understand. Framed 1.78:1 and anamorphically enhanced, the transfer here is impressive for what was doubtless a low budget film and shot on high speed stock (necessary for the later scene sin the van at night). As a result the detail is not quite reference quality and some fine grain is visible, but this only seems to add to the documentary feel of the visuals. Contrast and colour are very good, and the picture has a very pleasing look to it that always feels right for the film itself. The Dolby 2.0 soundtrack is surprisingly lively, with very good stereo separation on sound effects, and the noise and atmosphere of the stadium vividly evoked on our brief trip inside. Not much here, which is a real shame – I would have welcomed some information on how some of the scenes here were set up and filmed. We do have two textual extras. Jafar Panahi, Director is a very brief biography and filmography, while the more substantial and interesting Production Notes are provided by Panahi himself. As a confirmed devotee of Iranian cinema I am aware that I came to this film with a degree of bias, but a more user-friendly introduction to the pleasures offered by this country's very distinctive cinematic style you'll be pushed to find. Offside is a treat, a very human story that questions its country's political and religious doctrines, but does so with poignancy, intelligence and humour. Artificial Eye's DVD is disappointingly light on extra features, but the transfer is fine and for the film itself this has to come warmly recommended. * As it turns out (I did not realise this at the time the review was written) the film was actually shot at some speed during the qualifying match itself, which really is taking place in the stadium to which the girls have been denied entry. Thus the ending was effectively unwritten and largely improvised around the very real sports reports they are listening to. Had the Iranian team not won the match, who knows how the film might have concluded.